U.S. Supreme Court Justice Antonin Scalia, shown here in 2006, believes in an "originalist" interpretation of the Constitution — meaning that it is not flexible and does not change over time. Supreme Court Justice Antonin Scalia has agreed to a few select interviews to promote his new book on legal advocacy, Making Your Case: The Art of Persuading Judges. In the last of a three-part interview with NPR, he discusses his views on the Constitution, judicial activism and enemy combatants. 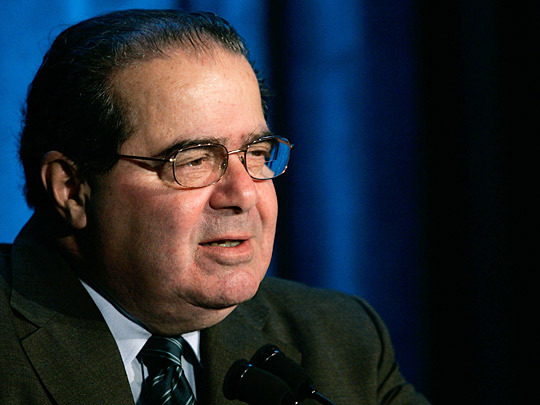 For Justice Antonin Scalia, the Constitution is not a living document, but a dead one. The Supreme Court's conservative torchbearer says he believes the Constitution's meaning cannot change over time. It was meant, he says, to impose rigid rules that cannot be altered, except by the difficult process of constitutional amendment. "If you somehow adopt a philosophy that the Constitution itself is not static, but rather, it morphs from age to age to say whatever it ought to say — which is probably whatever the people would want it to say — you've eliminated the whole purpose of a constitution. And that's essentially what the 'living constitution' leaves you with," Scalia says. Although he takes an "originalist" view of the Constitution, that its meaning today is the same as when it was drafted, Scalia says this doesn't mean he wants to undo past Supreme Court decisions with which he disagrees. "You can't reinvent the wheel. You've got to accept the vast majority of prior decisions. ... I do not argue that all of the mistakes made in the name of the so-called living constitution be ripped out. I just say, 'Let's cut it out. 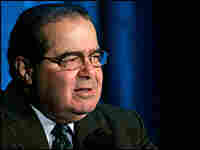 Go back to the good, old dead Constitution," Scalia says. This attitude puts him in a decidedly different camp than fellow conservative Justice Clarence Thomas, who Scalia concedes is far more willing to reverse past precedent. "I am a textualist. I am an originalist. I am not a nut," he says, underscoring that he generally doesn't favor undoing old rulings. He also notes that the idea of a living constitution places no restraints on judges. But Scalia's critics contend he applies this originalist view selectively. They also accuse him of judicial activism, noting that the more conservative court of recent years has invalidated far more federal laws than the more liberal court of years gone by. While there is such a thing as an activist court, he says, there is also such a thing as an "activist Congress, which pushes the envelope with statutes that do things that had never been attempted before." "And where that happens, you should expect a greater proportion of those congressional enactments to be invalidated," the justice says. And that extends beyond the Congress. Indeed, Scalia has surprised some critics with his hard-line view on what he sees as the excesses of the Bush administration in at least one area — the imprisonment without charge of U.S. citizens accused of being enemy combatants. "As with anybody arrested, you bring them to trial or you let them go," Scalia says. If his often blunt opinions make Scalia sound like a tough guy, his friends say he has a soft heart. Scalia is an only child, but he and his wife, Maureen, have raised nine children, including one who joined the military and another who entered the priesthood. "I take very little credit for the children. I was home for dinner. That was about it," Scalia says, noting that his wife also takes very good care of him. "She says she has 10 children," he jokes.